Friends for Life! Walk™ - Registration Now Open! Join us for the Friends for Life! Walk on the weekend of September 24th and 25th as Ontario SPA’s and Affiliates across the province raise funds for animal welfare! Find a walk in your community and register today at friendsforlifewalk.ca and help us change animals’ lives, one step at a time! The Ontario SPCA, the Ontario Veterinary Medical Association (OVMA), and participating SPCAs and Humane Societies in Ontario, encourage pet owners that if you've 'Got a Pet? Get a Vet!™'. It`s important to establish a relationship with a veterinarian. Just one check-up a year can help protect against a variety of potentially life-threatening diseases, detect health problems sooner, and avoid unexpected costs. Know an outstanding vet? Submit a nomination for the 2016 ‘Got a Pet? Get a Vet!™ Award’ and encourage friends and family to vote for the winner. Contest is open until May 23rd, 2016. Its cottage time and we couldn’t me more excited! There’s nothing better than finishing off the week by loading up the pets and heading out for a weekend in nature. In preparation for cottage season, we have some pet safety reminders to help make your Spring/Summer season a great one for everyone. Read 6 Tips to Follow When Bringing your Pet to the Cottage before heading to the great outdoors! 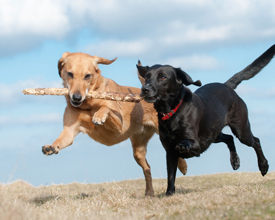 Tick season has arrived and we ask Dave Wilson, Director of Shelter Health & Wellness for the Ontario SPCA and retired vet, what we need to know to help keep our pets safe. Ticks are members of the spider family, and their bites can cause serious illness such as Tick Paralysis or even Lyme disease. It’s important to learn tick prevention and treatment. Read our two part series “PET HEALTH CORNER: The Truth about Ticks” and watch our You Tube Video “How to Remove a Tick” for more information. 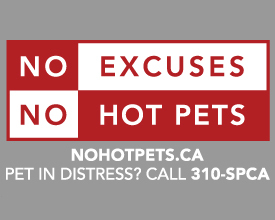 Join us on May 24th by visiting nohotpets.ca for the official launch of our 2016 No Hot Pets campaign! 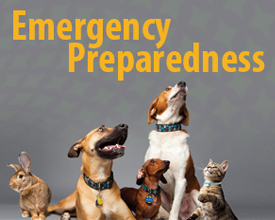 May 1st – May 7th was Emergency Preparedness Week and the Ontario SPCA wants to help keep your pet safe. Head over to your local Ontario SPCA Animal Centre to pick up an Emergency Preparedness window decal or sign up online to receive one in the mail. Ready for an emergency? Create your very own Pet Emergency Kit! Download the checklist and don’t forget to visit ontariospca.ca/ep to learn more about keeping your pets safe during an emergency.